Milind Soman and Ankita Konwar are all set to tie the knot in Alibaug. 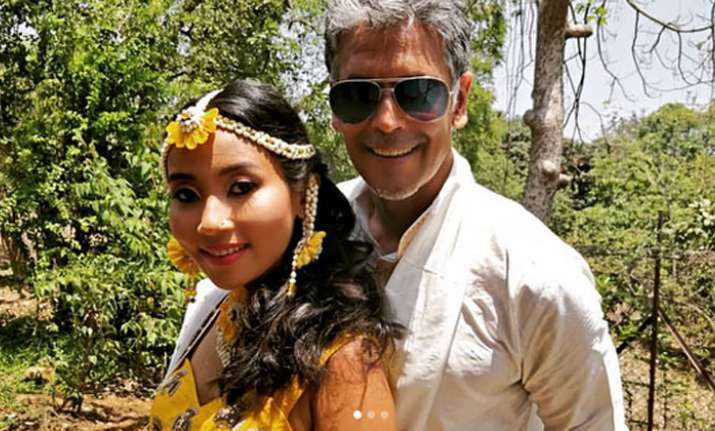 Milind Soman and his long-time girlfriend Ankita Konwar are all set to tie the knot today. Yesterday, people saw many romantic pics from their pre-wedding rituals. The functions are taking place in the presence of the close friends and family members of the couple. Milind and Ankita’s pics indicate that marriage need right time and not right age. Well, it is indeed heart-breaking for many that the handsome hunk is taken. So, here’s all you need to know about Ankita, the girl who stole Milind’s heart. If latest reports are to be believed, both of them have been dating since last October. The lady was a senior flight attendant and left her job in 2018. She can speak multiple languages like Hindi, English, Bengali, French and Assamese. Milind and Ankita came to limelight because of their age gap. The actor is almost 26 years elder than the lady and because of this fact both of them were criticised. But as we all know love has no boundaries, so, now these two-charming people are all set to take wedding vows in Alibaug. Ankita is going to be Milind’s second wife as he was earlier married to French actress Mylene Jampanoi till 2008. Now, we are waiting for their wedding pics.